KADIMA LEADER Tzipi Livni has once again revealed how left-wing she has become in an interview this week in The Atlantic, in which she blames Netanyahu and Israel for its own delegitimization, takes the J-Street view that US pressure on Israel is a good thing, and claims that by championing a Palestinian state, she carries the mantle of Jabotinsky (who was the prime Jewish opponent of partition). The interview began innocently with the public rift between the Prime Minister and President Obama and how American Jewry have been caught in the middle. Yet soon enough Livni took the opportunity to get down to basics. Netanyahu believes in hasbarah. Hasbara is explaining, it is not policymaking. Hasbara is not everything. Hasbara is just making great speeches. And it's not enough. There is an intimacy and trust that is needed between leaders, between their assistants and advisers. Usually you have the real substance behind closed doors, and the press conferences, you have niceties, nice photo ops. But here everything is reversed. In other words, if Israel would have the right policies—i.e., peace policies—the world would come around. And as for the lack of intimacy and trust between Netanyahu and Obama – it’s Netanyahu’s fault. (Side-note: Jabotinsky rejected secret negotiations and praised public diplomacy as the best way to defend Jewish interests in the international arena). But wasn’t Israel the one that initiated the Oslo Accords and empowered the P.L.O. with territory, money, weapons and international legitimacy? Hasn’t Israel essentially been pushing two states for two peoples for the last almost twenty years? Didn’t Netanyahu himself “talk about two states for two peoples” by endorsing a Palestinian state just a few months into office? And where has all that gotten us? Certainly hasbarah on its own is not enough, but while Israel pursued a peace-policy, it saw its popularity plummet. You know why I am so angry at Israel? Because I volunteered on a kibbutz. You were such a great country. I was proud to be there. I loved you. But what has become of you? Livni buys this anti-Israel line wholeheartedly, explaining that this is what is happening with American-Jewish youth. Again, she believes that it is Israel’s own actions which have transformed it into pariah, not the blood libels being push by an entire civilization which is united by its hatred of the Jewish state in its midst. She even went as far as to praise the pressure Obama has brought to bear on Israel, stating: “When Obama pushed Bibi, Bibi made some steps forward. The American pressure led those who don't believe that time is of the essence to a better understanding that there is no status quo option.” This is essentially the same line J-Street has been using to justify its call for pressure on Israel, and Livni’s words are no doubt being e-mailed to the organization’s membership as evidence of the justness of their anti-Israel cause. Yet, Livni accepts that “we have these extremists in the region that are not willing to accept our existence in any way,” and adds that “I don't want those who don't accept Israel's right to exist. There is no use for a dialogue with them.” Apparently, however, she hasn’t heard that Fatah also rejects Israel’s right to exist (See Khaled Abu Tomeh,Fatah: No to Israel as Jewish state, no land swaps, Jerusalem Post, Nov. 28, 2010). Nor has she heard of the recent poll of Palestinians commissioned by the Israel Project in which two-thirds of Palestinians agree that the ultimate goal should be to destroy Israel (and 84% under different wording) or the similar results to the same question asked a year before. (See In Defense of Benny Begin, for further evidence of the Palestinians’ rejection of Israel). So with whom does she want to negotiate? The Atlantic: Are you saying you better represent the values of Jabotinsky than Netanyahu? 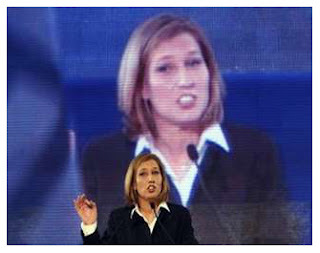 Livni: Here's an image. In our youth movement [Jabotinsky’s Betar], in my parent's generation, we had a song, "Both sides of the Jordan, this one is ours, and also the other one." But there's another line, saying basically, "Soon we will live happily ever after, the son of the Arab, the son of the Christian, and my son." The idea was always not to control others, but live together. Okay, so we know today we cannot live happily together between the Jordan and the Mediterranean, because we would lose the sovereignty of the Jewish state as such. So we need to divide the land. This is the way we live together, in a nice divorce. So in Livni’s mind, she represents Jabotinsky best because she completely rejects his belief in a Jewish state with a Jewish majority over a maximum amount of territory in which Jews and Arabs could live in peace together in one state. That’s just confusing.